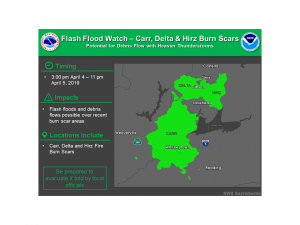 April 5, 2019 – Several weather systems will impact Northern California through the weekend into next week. Mountain travel delays are possible into early Saturday with snow expected generally above 6000 feet. 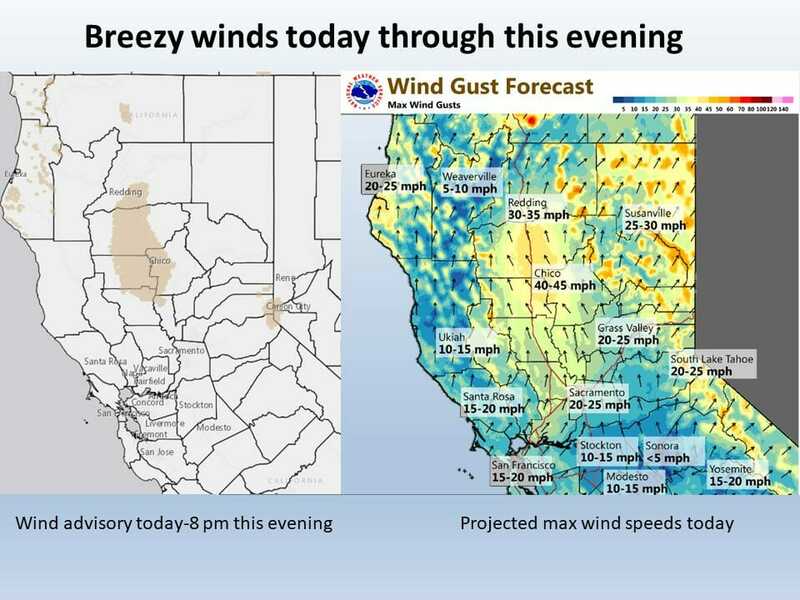 Gusty winds and thunderstorms are also possible today, mainly over the Northern Sacramento Valley. Fairly quiet this morning as a moderately strong Pacific frontal system approaches the coast. EKA radar is showing some shower activity west of the forecast area and expect precipitation to pick up over interior NorCal later today as the front moves inland. 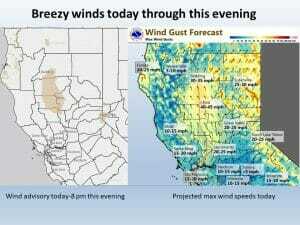 Current timing puts the front over the northern Sacramento valley this afternoon and then east of the forecast area by late this evening. Surface gradients over the north state increase later this morning and winds may pick up to advisory criteria for a period of time as the front passes through. 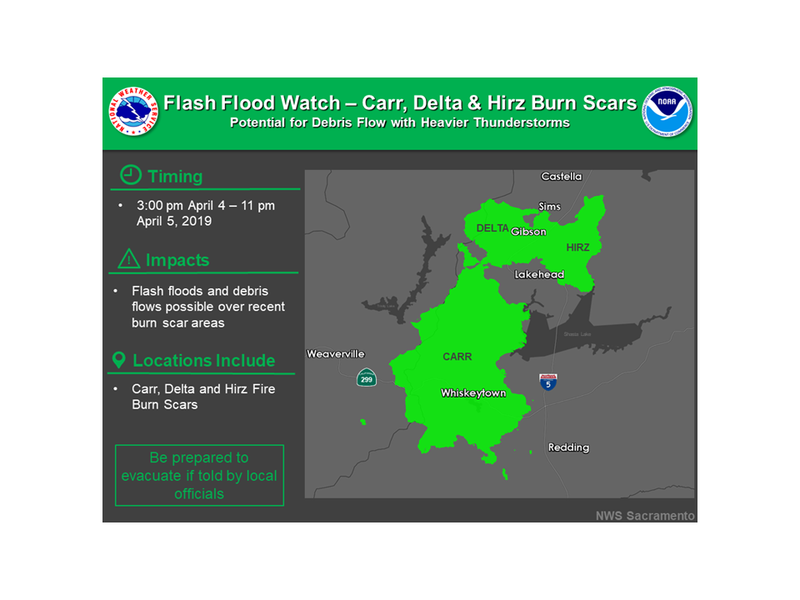 Overall precipitation amounts are not expected to be excessive but surface southeast flow may provide enough orographics for heavier precipitation north of the Redding area so will leave up the flash flood watch in place for the burn areas there. Models showing enough instability for some afternoon thunderstorms. Maximum Cape from GFS showing best thunderstorm threat will be over the northern Sacramento valley north of about Chico. Not much going on over the Sierra this morning but expect uptick in precipitation later today as the front pushes in. Predicted snow amounts down some from 24 hours ago and in line with winter weather advisory now in place. Models shift cold front east of the state by this evening with showers overnight behind the front. Next Pacific storm system moves onto the west coast by mid day Saturday. This system will be taking a more northerly track so heavier precipitation will stay mainly north of the CWA with light showers expected most areas. Upper level ridging builds slightly on Sunday pushing the rain threat line northward to about about the interstate 80 corridor. A this time, the southern half of the CWA looks dry Sunday. A slightly stronger system continues the wet pattern on Monday pushing down the upper ridge and bringing light precipitation to nearly all of the forecast area again on Monday. A progressive shortwave trough is forecast to slide eastward across Northern California Tuesday morning. The parent cold front will have swept into Nevada at this point leaving unstable post- frontal air over the region. Much of the precipitation should congregate into the Sierra-Cascade ranges with numerous snow showers expected for Tuesday. At this point, snow levels will remain in the 5,000 to 5,500 foot range which could create minor travel impacts where these showers fall. By the middle of the week, the mid/upper-level flow becomes northwesterly in nature which should dry conditions out. The exception would be the mountains where a few lingering snow showers remain possible. Model uncertainty grows for the days following with notable deterministic and ensemble spread. The GFS/GEFS solutions in particular favor tracking an upper low down the coast on Thursday although this could easily shift toward the east as some runs have shown. Have introduced increasing POPs for this period although not completely convinced it will be wet late in the work week. The ECMWF model runs show more of an “Inside Slider” track which is drier for the region. It seems likely temperatures will be below average with highs in the mid 60s over the Valley and 40s/50s across the mountains/foothills.